ANYONE WHO cares about Hackney – no, London – will be interested in property, the problem that is now causing such fear and loathing throughout the capital. 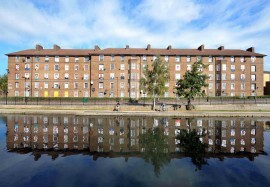 So they may want to be at the Rio on Saturday when film director Andrea Luka Zimmerman will show Estate, A Reverie, her documentary on the last seven years of a housing complex next to the Grand Union Canal in Haggerston. With local author Iain Sinclair she will discuss the issues raised, in a question-and-answer session after the film, which premiered in London last year. It alights on the oddity that when social housing is demolished, some residents and others, cheer, believing that they will be shepherded into superior accommodation. But often they start to realise what they stand to lose, and nostalgia and worry set in. That was the case even with the Haggerston Estate, despite its having becoming known in the late-1990s as “the heroin capital of Europe”. It was a pre-hipster time – Hackney in those days earned the nickname “Crackney” – and some tenants of the Haggy were “desperate” to move away from the flats, which badly needed repairs by owner Hackney council. Yet that was when Zimmerman, herself raised in social housing, in Munich, West Germany, moved to the estate, taking a flat on the top floor of its Samuel House a month after she applied to the council. Now she is not just a respected film-maker she is a doctor of philosophy on the staff of Central Saint Martins. Not bad for someone who left school at 16 to be a hairdresser. * Estate, A Reverie (83 minutes), Rio Cinema, 107 Kingsland High Street E8 2PB (020 7241 9410), Saturday 10 Jan 2015, 2.30pm, £6-£7.50. Good disabled access.